How to make flipbook which can be read in Smartphone? In nowadays, reading E-book on phone has become a habit of most the commuting. For preparing a long journey, simply packing package is not enough, maybe you will need to download some pieces of music and some favorite E-books. By those books and music, you can kill the boring time on the train. In this article, I will show you how to make E-books by yourself. At the beginning, I feel it is necessary to make a brief introduction of VeryPDF Flipbook maker. This software was developed by VeryPDF software company and it is aimed to make flipbook from all the printable files and it made it. 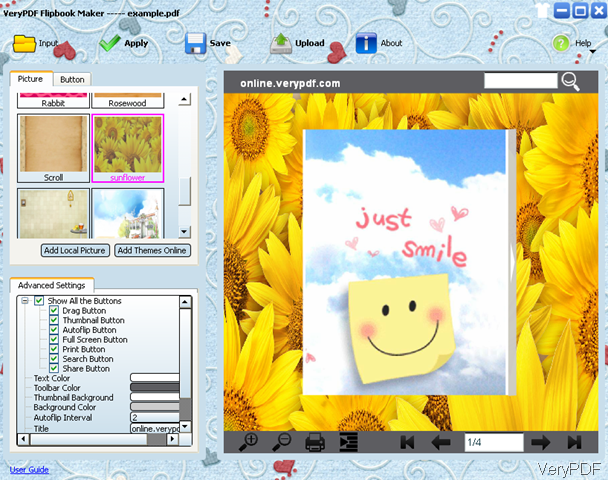 By this software, you can create flipbook from PDF, Office files (Word, Excel, PowerPoint, etc. ), HTML web pages and images and the output PDF file can be read on the Smartphone. Download Flipbook Maker. It is a GUI version software. So please install it like the other GUI version software. After installation, there will be an ion on the desktop. Double click it then you can enter the software interface. The following snapshot is from this software interface. By this software, you can set the book background, theme and buttons. Allow you to change the text at the top of the book. The toolbar and auto flip interval are optional. The background music can be set as your favorite music. Second, save it locally or upload it directly. If you want to save it locally, simply click Save. If you want to read it on the Smartphone, please upload it to your private account on the VeryPDF sever. After loading, there will be a URL and embedded code produced. By this URL, you can read it at any place. By the embedded code, you can insert your book to any blog or website. Now let us check one example from the following URL:http://online.verypdf.com/u/62/flipbook/example/index.html. Maybe someone can not help wondering that if I do not want to visit the website to read the book, this software will be useless for me, is that right? -- Yes, you are right. The flipbook made by this software can not be copied and pasted to the cell phone. The only way to read it is that upload it to the website then read it by the URL. Question again: Do you have any flip maker which allows me to copy the book directly to my iphone then I can read it without network connection? --Yes, we have. If you want to read flipbook like that, please have a free trail of this software: VeryDOC PDF to ePub Converter and HTML to ePub Converter. By those two software, you can convert PDF and html to epub file format which can read on the cell phone directly. How to convert mhtml to wmf? This entry was posted in Flipbook Maker. Bookmark the permalink.